Each year The New York Times features a handful of menorahs, and we were thrilled that they chose to feature our Tree Menorah this year! 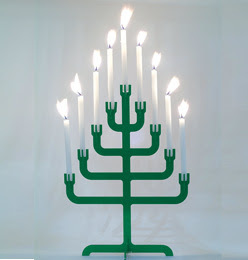 The tree menorah is perfect for holiday parties and for those who celebrate Chrismukkah (remember the holiday from the OC?) The Times also featured two other products we carry - the dreidel menorah, designed by Israeli artist Avner Agayof and wax-off, one of the greatest inventions ever!